The Asian Development Bank announced on Wednesday a $500 million emergency loan for reconstruction efforts after the devastation caused by Super Typhoon Haiyan in the Philippines. A further $23 million will also be provided in grants to address immediate relief assistance needs for affected communities mainly on the island of Leyte. Of the total, $20 million comes from a trust fund for poverty reduction managed by the Japanese government, and the remaining $3 million from the bank’s Asia-Pacific Disaster Response Fund. “We are working … to provide hope and rebuild the lives of more than 11 million people affected by what is being described as one of the Philippines’ worst ever natural disasters,” ADB President Takehiko Nakao said during a brief news conference in Manila. 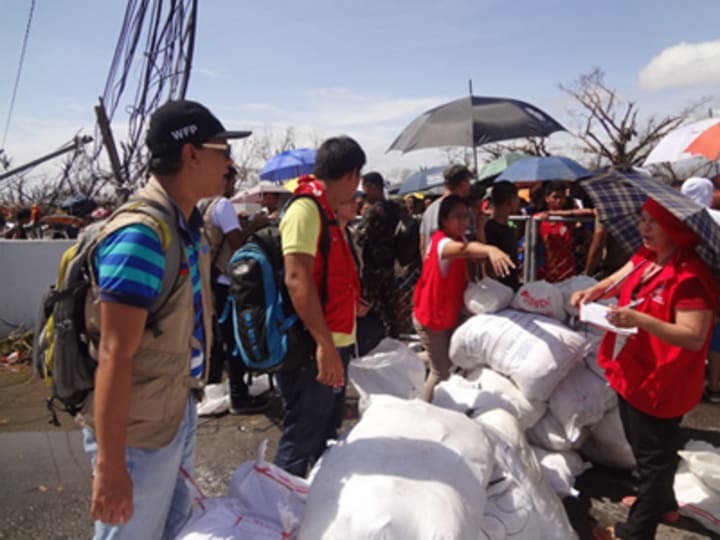 The institution has also formed a 40-member special response team with vast experience in post-disaster situations to coordinate with the government and development partners for recovery and rehabilitation efforts after Haiyan, which has claimed more than 2,000 lives as of posting time. “[We] will provide full support to the people and the government of the Philippines, together with other development partners, to speedily implement both needed relief and reconstruction — especially as the Philippines is our home,” Nakao said. Click on the image to view in large size. Apart from the ADB loan, the Philippine government has received almost $90 million in cash and in kind from 36 donor countries and international organizations. Leading the pledges is the U.N. Office for Coordination of Humanitarian Affairs with $25 million, while Japan and the United Arab Emirates share the second spot with $10 million. 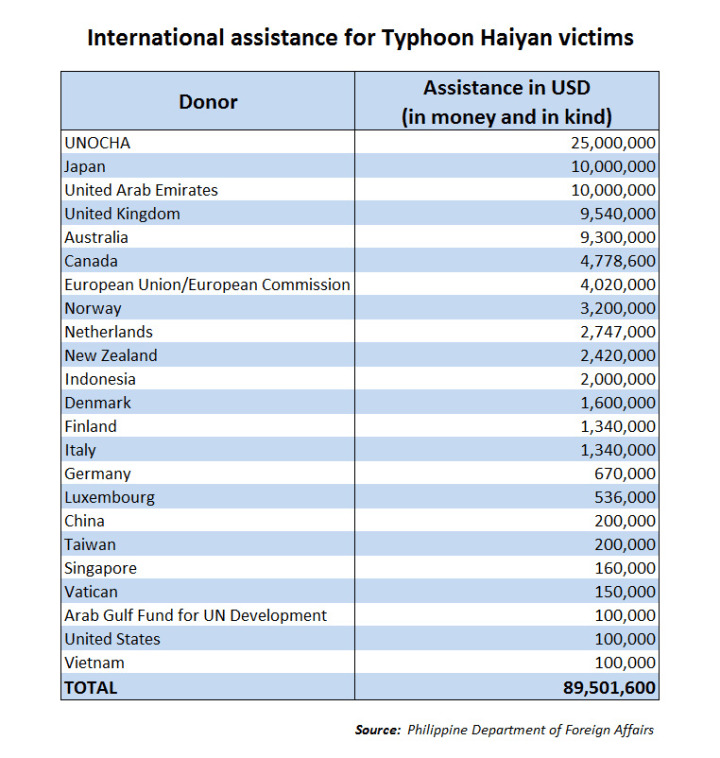 Other top donors are Australia and the United Kingdom, with more than $9 million each, according to the latest data posted by the Philippine Department of Foreign Affairs. “All international donors that have pledged monetary donations are coursing the money through their aid agencies or through NGOs and charitable institutions” except Indonesia, said DFA spokesman Raul Hernandez. The department lists only $100,000 from the United States, but the U.S. Agency for International Development has officially committed $20 million and to deliver up to 55 metric tons of emergency food products and other supplies through the U.N. World Food Program. In addition, the aircraft carrier USS George Washington is en route to the Philippines with 80 aircraft and 5,000 sailors to help deliver goods in far-flung typhoon-affected areas that have been cut off from aid so far.